We introduce eight reflective colors. The Linear Roadster, Linear Limo and Linear Limo LR are in stock. Most sizes and colors are ready to ship in under a week! 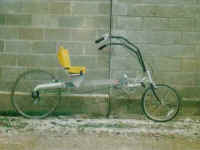 2011 ‘Bentrider Recumbent Bike of the Year! 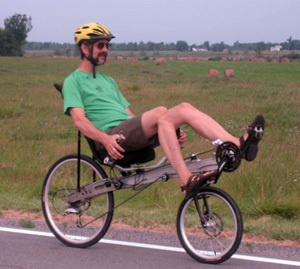 In January the Linear Roadster is named 2011 ‘Bentrider Recumbent Bike of the Year! We add a 900 sq ft manufacturing and storage facility and move in. We introduced the XL (extra light) component group option, bringing the Roadster’s weight to 30 lb. We now have models to fit riders from 5′ 4″ to 8′ tall and up to 275 lbs. The new Linear Roadster is in production. Shipments to customers began in February. Linear moves into a newer, larger building in May. The SWB project progresses again this year and gains the name “Roadster”. The SWB project has gone through 4 iterations and is now a 20″x26″ with dual disk brakes, 27 speeds and a RANS seat. Feedback is collected from thousands of miles of test riding by our staff and hundreds of customers. Progress slows as renovation begins on our new 3500 sq. ft. building. Linear runs out of space and purchases a larger building which needs renovating. Linear Recumbents began development of a new Linear Short Wheel Base (SWB) Recumbent Bike to replace the old Linear Sonic. Our first demo bike had dual 20″ tires, 24 speeds and dual V-brakes. It was well received by the crowd at the 2007 Bentride. 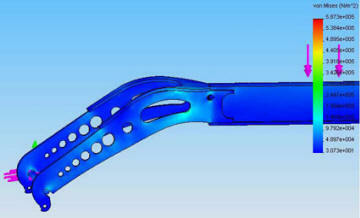 We went back to FEA and increased the strength and stiffness of the new frame a bit more. 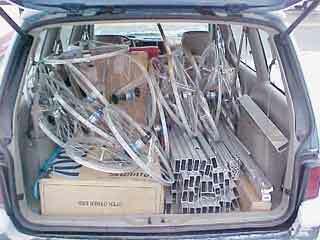 In the summer of 2006 we sold the first Linear Limo 3.0 to Chris Kelley. 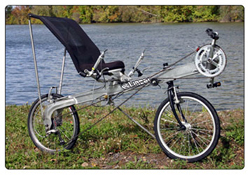 Check out the Linear Limo 3.0 Recumbent Touring Bike. In late 2002 Linear manufacturing went out of business. Bicycle Man llc bought the assets of Linear Mfg Inc. and began redesigning aluminum recumbents using modern engineering technology. Production of recumbents bearing the Linear name is begun in Western NY where Linear Recumbent Bikes are alive and well today. The first 1,000 pounds of Linear inventory. Since then Peter have been working with Senior Engineering students and professors from Alfred University; SUNY Alfred and Perdue University to improve Linear Recumbent Bikes. The Linear LWB (Long Wheel Base) was first to be redesigned beginning development in 2003. The frame design was begun with computer FEA testing. A prototype was built and put through static and dynamic tests. The most fun part of this testing was attaching strain gauges and accelerometers to the frame and a laptop computer behind the seat. The bike was then raced through potholes, off curbs and up hills by a 240 lb rider. After analyzing the data we felt confident enough to loan it to a 250 lb rider who rode the Limo 800 miles then strapped on an additional 50 lbs of gear and rode from Maine to Georgia. Upon completion of the trip the Linear Limo 3.0 was shipped back to Western NY and stripped to the frame to undergo a dye penetrant test looking for fatigue cracks. A certified technician?s report found that the New Linear Limo 3.0 passed nuclear specs. Late in the summer of 2001 Dave Bures purchased Linear from Steve Hansel. Dave found the bike business less profitable than he had expected. Dave sold much of the remaining inventory to The Bicycle Man in late 2001. Linear Manufacturing went out of business in 2002. Bicycle Man llc bought their physical assets, intellectual property and trade name and moved them from Guttenberg, Iowa to Western New York where Linear Recumbents have been redesigned for strength and durability and are back in Production Today! ~ Tricia at Linear Mfg. Inc.
Steve Hansel bought Linear Mfg. Inc. in 1991 when Dirk Kann’s other business ventures picked up. It began when Dirk Kann and Steve Leitgen designed what would become the Linear LWB. 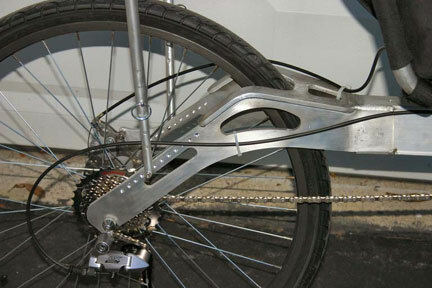 Dirk went on to manufacture Linear Recumbents when his aluminum fabricating business was slow in the mid 80’s. The first production Linears (~1985) had over seat handlebars that looked like they would be at home on a Harley chopper. We have the first Linear ever sold in our collection, as well as the first with US. Stop in and see them if you are ever in Western NY! They were comfortable and handled well on the road but were difficult to manage in sharp turns. 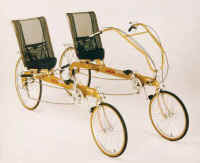 They had so much “tiller” that to make a sharp right turn you had to put your left hand on the right handlebar! They soon added the familiar USS handlebar which quickly became much more popular and the OSS was discontinued. Three photos of another variation of the rear wheel attachment. The first Linear models had over seat handlebars that looked like they would be at home on a Harley chopper. They were comfortable and handled well on the road but were difficult to manage in sharp turns. They had so much “tiller” that to make a sharp right turn you had to put your left hand on the right handlebar! They soon added the familiar USS handlebar which quickly became much more popular and the OSS was discontinued. This prototype has recognizable rear frame “chainplates”, the familiar rear wheel attachment. Promotional photo of early Linear machines. The serial number of a Kann’s Linear (or Iowa Linear) is just a few digits compared to the long serial numbers on newer Linear frames. You can tell an original Kann Linear by the short serial number. To find the serial number, look on the bottom of the main frame beam behind the front fork. We are now hand inscribing short serial #s on the Linear Recumbents we are completing. Early USS Linear with Kann employee Randy Heller.